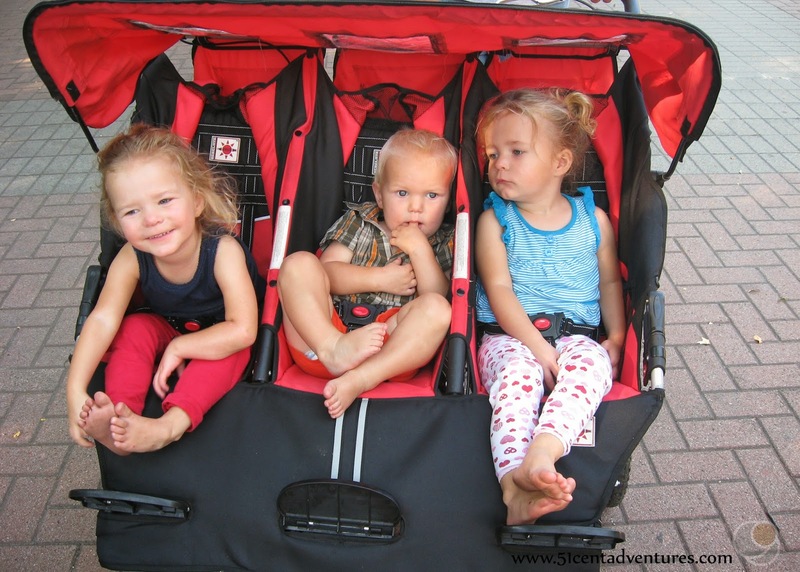 51 Cent Adventures: Is a triple stroller right for you? I bought a triple jogger stroller when my son was 4 months old and my twin girls were 21 months old. I felt it was a great purchase. I thought I would use the stroller for years. However, I sold the stroller a year later. Several things had changed in my life. Even though I still loved the stroller, I couldn't use it anymore. From my experience I learned that various factors determine how often you will use a triple stroller. Having three kids close in age isn't enough. If you are in the market for a triple stroller you are probably wondering if they are worth the cost. I can't really answer that because it depends on your situation. What I can do is tell you some things you should consider. Thinking about these things will help you decide if you should buy a triple stroller. I strongly suggest getting a triple stroller if you value your independence. The main reason I bought the stroller was so I could have a way to go places with my children while Brandon was away at Army basic training. While he was gone I was able to participate in activities with my extended family without feeling like a burden on anyone. I didn't need anyone to ride with me, or meet me in the parking lot of where ever we were going. I could just show up, set up the stroller, buckle my kids in, and and meet up with everyone. I could also leave whenever I wanted. The stroller gave me a level of independence that would have been impossible without it. Do you usually travel with other adults? On the other hand, if you expect have a helper along for the fun, you may want to consider buying two separate, smaller strollers. Like a double stroller for two of your children and a single stroller for the other child. You can push one and your spouse/mother/mother in law/sister/friend/whoever can push the other one. 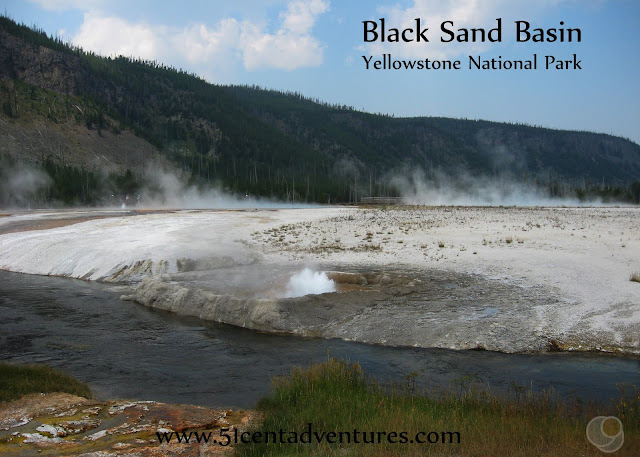 Do you frequently visit places that are within walking distance? A triple stroller can be a good alternative to driving a car. When I first bought my stroller I used it primarily to take my kids to any of the three parks that were near our apartment. I also loved taking my kids to church and to the library in the stroller. However, If you drive most places, then maybe a triple stroller isn't for you. After we moved to our current neighborhood I didn't have as many reasons to use the stroller. Our neighborhood is separate from all other areas by a busy highway, so walking to the library or grocery store isn't even an option. Plus I am completely spoiled with a park across the street from my house. One thing I liked about the triple stroller was that even though it was expensive, it was considerably cheaper than buying a second car. The stroller gave me a lot of independence when my husband took our car to work. After we bought our second car the stroller wasn't so important anymore. Do you have a large place to store the stroller? I knew the stroller was big, but I wasn't prepared for just how large it was. I called it the Batmobile because it reminded me of the Tumbler from Batman Begins. It barely fit in a large space under the kitchen counter of my apartment. When we moved to our house I usually just left it on the porch. Will the stroller fit in the cargo space of your vehicle? Before you get too excited about buying a triple stroller you should make sure it will fit in your car. Most of the triple strollers on the market are very bulky and are large even when they are collapsed. My BeBeLove model took up most of the space in the back of my Jeep Cherokee. It fit a little better in the back of my Honda Pilot - when the third row of seats was folded down. When the third row was up the stroller didn't fit at all. You need to take the bulkiness of the stroller into account when you plan trips. I originally wanted to buy the stroller to take on our 2012 road trip to Colorado. After a while I realized that if we brought the stroller we wouldn't have much room to pack anything else. So I waited a few more months to buy the stroller. In 2013 we did bring the stroller on our road trip, but we didn't camp anywhere that year. The stroller took up all the space where we would have packed our camping gear. Can you lift bulky and heavy things? This is another size related issue. You'll have to lift the stroller into your car. Are you strong enough to do that? Depending on where you store the stroller, you may need to lift it through a doorway into your house. Will you be able to carry it short distances? Are you comfortable with bicycle repairs? 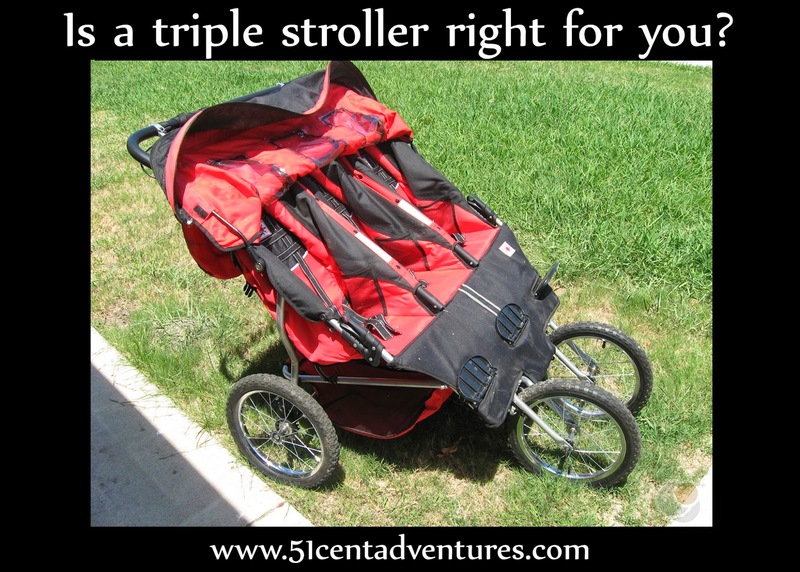 Most triple strollers have tires with inner-tubes. Do you know how to patch inner-tubes? Also, most likely you will have to take the back tires off in order to fit the stroller in your car. The process is fairly simple, but will you be okay doing that every time you want to take the stroller somewhere? Do you need to go inside many buildings? Most triple strollers are too wide to fit inside of regular doorways. So while they work great in outdoor settings like parks and zoos, they aren't so great for indoor places like museums or libraries. I came up with a work-around that let me take my kids inside buildings without carrying my heavy son in my arms. When I took my kids to the library or church I would park and lock up the stroller outside the building. I kept a small umbrella stroller on the sunshade of the triple stroller. I would unfold that and put my son in it. Then I'd wheel that into the building with my twins holding onto each handle. Up until my twins turned 2 1/2 years old I NEEDED the stroller to take them anywhere that required a lot of walking. They couldn't walk very far on their own, and they didn't listen to me very well. I liked that I could strap them into the stroller and they had to come with me whether they wanted to or not. The stroller was also nice in case any of my kids fell asleep as we walked. But as the twins got closer to 3 years old they were able to walk farther and follow me better. It became a lot easier to just have them walk while I pushed my son in a little umbrella stroller. When I bought my triple stroller I planned on using it for several years. But less than 6 months later I found out I was unexpectedly pregnant again. More than anything else, my pregnancy with my fourth baby was the reason I stopped using the stroller. During most of the pregnancy I was too tired to push the stroller with all three kids in it. Once the baby was born there wasn't any place for her to sit in the stroller. In theory I could have put her in a baby wrap/backpack and still pushed the older three in the stroller, but the thought of how much physical exertion that required made me want to cry. Even with my husband around to help we really couldn't use the stroller much. We bought our second car to make room for the baby, but that meant we didn't have any room in the car to transport the stroller on trips to places like the zoo. So if you are planning on having another baby anytime in the next year or two maybe you can just find a stroller to borrow for the time being. Hopefully these questions have helped you decide if buying a triple stroller is right for you. Even though I didn't use my stroller as long as I thought I would, I'm still glad I bought it. It was worth it for the few months I needed it. My kids, husband, and I were able to use the stroller to create a lot of great memories. I love this post. I am not thinking about buying a triple stroller (my oldest is 5 and quit using a stroller almost 3 years ago) but when buying a stroller there are always so many factors to consider. There was once a time when my husband took our only car to work and all I had was a stroller and my baby. And we were about a mile away from stores and fast food chains. So we did a lot of walking that summer and I really got in shape. I miss that!